Since we have a cabin near Twain Harte, we are always looking for a good day-hike or two in that area. And the last time we hiked out of Gianelli Tralhead (a long trip to Huckleberry Lake over five days or so) P noticed an interesting granite knob at the end of the ridge north of Burst Rock. Burst Rock is where the trail from Gianelli Trailhead enters the Emigrant Wilderness. When he checked the topo map, it looked pretty easy. And so this weekend we decided to go check it out. It was a warm morning at the cabin, but by the time we drove up to the trailhead, the temperature was lovely. We spend a bit more than an hour tracking down the little dome, and enjoyed really wonderful views from on top during our lunch. We also found both a bit a snow from the heavy winter we had, and quite a lot of water from thunderstorms that had hit the area the day before. And as we looked East at Sonora Pass, we could see those clouds building once again. But just North of us we could clearly see Powell Lake below us. So we took off cross-country again, this time to work our way down to Powell Lake. It was a cake-walk, and we took a vfew photos, and then decided to race back on the trail to beat the thunderstorms that were obviously coming in our direction. As we walked out, we met quite a few people hiking in. They were going to get wet. This is a lovely area. 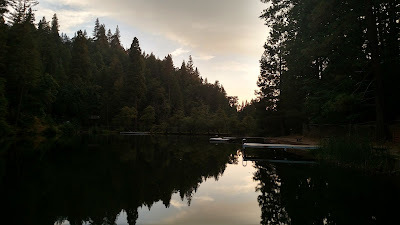 And when we got back to the cabin, we walked down to our own little lake for a nice shot at sunset.